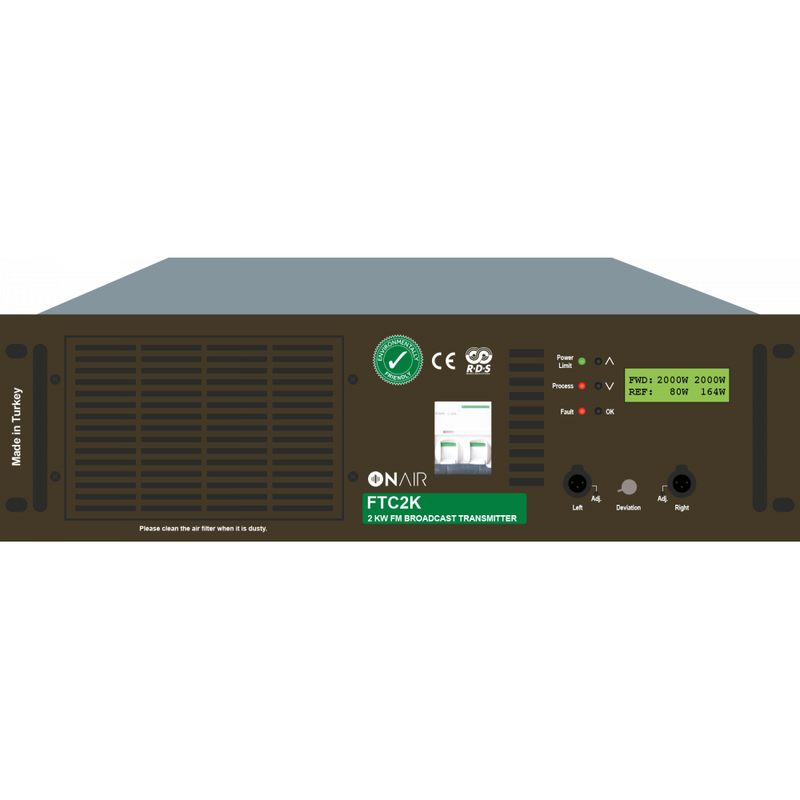 FTC2K FM compact Transmitter is manufactured with state-of-the-art and highly efficient LDMOS transistors which reduce the Operating, cooling and maintenance costs and have a longer life span. Direct to channel modulator delivers superb signal quality and crystal clear sound with unrivalled performance. The FTC2K FM compact Transmitter comes with cloud-compatible remote control software with a simple interface. All the features of the device can be viewed and controlled via the built-in web server or OnAir service center. With 3G/4G USB support, the device can be easily controlled even in rural areas with mobile phone signal thanks to cloud support. Thanks to the built-in RDS encoder and the special web protocol we have developed, we work with most of the radio automation software and automate the release of the song and artist name. Thanks to the built-in silence detector, it detects the sound interruption in the broadcast, sends you a warning message if you wish, and activates the backup audio service if you wish. 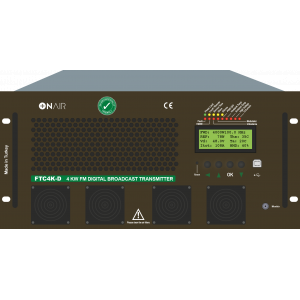 FTC2K FM compact Transmitter contains multiple redundant audio sources (analog audio input, IP audio, built-in audio player). In the event of audio interruption, changing the audio sources according to your preference ensures that your broadcast always has a sound. 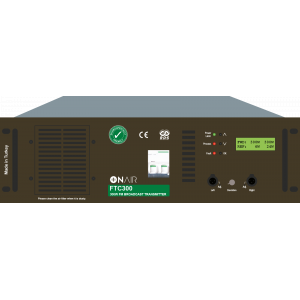 It has integrated audio processor which can decode Shoutcast, Icecast, HE-AAC v1/v2, MPEG-1 Layer 3 compressed audio streams, OGG compressed audio streams, and lossless uncompressed PCM streams, over IP networks. Even with behind NAT connections, 3G/4G connections and Firewalled connections, FTC2K provides high sound quality without the need of user interference. FTC2K FM compact Transmitter supports MP1, MP2, MP3, OGG, AAC, HE-AAC, MPEG-4 ALS, OGG Vorbis, FLAC, Musepack, SPEEX, and WAVE file types. With the built-in 8 GB memory, you can store approximately 1000 hours of audio recording. In case of any warning or error, the device sends E-Mail and/or SMS notifications to specified email addresses and phone numbers. FTC2K FM compact Transmitter is ready for 1+1 backup system. By connecting a spare device with a coaxial switch, it enables the broadcast to continue uninterrupted in the event of any failure. Identification of spare devices and connections are made easily. The whole control system comes in the transmitter internally. In case of failure of the device defined as master, automatic switching to Slave device is provided.